I've always heard that when you are overwhelmed by things that you have to do (or want to do) you should choose 3 to 5 things and put everything else out of sight and out of mind and just focus on those things that you have chosen. In theory you should choose a long term project ( like hand quilting my Dear Jane), a medium project, and something you can complete quickly like a quilt binding. Well, while I've been been working on getting focused and choosing those projects, I decided to make just a couple of the Scrappy Trip blocks that I've been seeing everywhere on the internet. The block on the left is made from strips pulled from my scrap bag. While sorting and organizing my Kaffe fabrics, I found these 2 1/2" strips used in the second block. I think they could both be used in the same quilt. I've been sewing once a week with a group of ladies at church that are making charity quilts, little girl's dresses, and pillowcases. 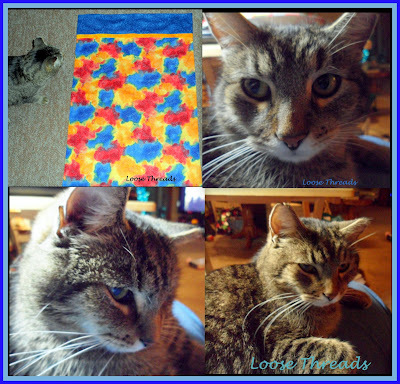 I made this pillowcase, and our cat Tiki decided to investigate. He came to our door the week before Halloween wanting a friend and some food, and we took him in. My daughter named him Mortimer since we brought him inside 2 days before Halloween, but he answers to Tiki. You can find my hot dog pillowcase tutorial here. I visited Daniel today. He is such a happy guy, and I just love him to pieces. Hope you are stitching today. Thimbles, Tumblers and Hexies....Oh My! I was going to post my New Year's resolutions the first of the year, and now I'm glad that I didn't because most have gone by the wayside already. One resolution was to post to my blogs more often (or at least somewhat consistently), and you see how well that's going. Another resolution was to get organized. Well........I took a before photo of my sewing room, took everything out, sorted, organized (or so I thought), and now that I've put it all back in it actually looks worse than before I started. For those of you that have been over to my crochet blog, you know that I also have a yarn stash. I switched some things around and now it doesn't seem to want to fit. So the solution? I'm still working on that. My family says that I need to have the word FOCUS tattooed on the inside of my eyelids. Did I also mention that I got an IPad for Christmas and that has taken up quite a bit some of my time? Meanwhile, I wanted to share some things that I found in my sewing room. I had a basket under my sewing table with a red bag of little 1 1/2" nine patches that I had leftover from this quilt. There are 964 of the 1 1/2" finished nine patches in this quilt set with alternate squares. I entered it in the Hoosier Heritage Quilt Show in Bloomington, Indiana, a couple of years ago and won a Judge's Recognition ribbon. Underneath the bag of leftover nine patches I found this tin of red and white tumblers (thimbles) that I'd cut. They are 1 3/4" high so will finish at 1 1/4". Then there was a bag of tumblers cut from repro fabrics. I remember I had started cutting them from charm squares when Kathie's tumbler quilt appeared on the front cover of Sew Scrappy magazine. I need to count them. There might be enough for a quilt top. While sorting, I discovered that you can cut a 3 1/2" and a 1 3/4" tumbler (thimble) from one charm square. That was one of the times when I lost my focus. Continuing to the bottom of the basket there was a bag of 3 1/2" tumblers cut from my 30s fabrics. I need to count these, too. Another bag with 1 3/4" thimbles cut from 30s fabrics. Looks like there are 197. I am still hand quilting this little quilt made from a bag of little tumblers that I won on Kathie's blog Inspired by Antique Quilts. Then I found this little Christmas elf in red work. Roswitha from Blauraute blog sent me the pattern for this quilt a couple of years ago. I have all of the patterns traced. I hate to think how long this little guy has been stuck in this hoop. Then there are more hexies. I have been working on other hexagons off and on and had forgotten about these. These are mostly stitched over those plastic templates that you remove with a stick. I really prefer using the paper pieces. If you look closely at the photo there are hexagons in brights, some in 30s and a few others in ???? The thing is that I found enough in that one basket to keep me busy for 6 months...maybe a year....and there are drawers of fabric. I have fallen wayyyyy behind on responding to blog comments, but I really appreciate all of your kind words and visits to my blog. This is the red and white antique quilt that I showed you around Christmas. My Grandmother made this quilt. She was born in 1890 and died in 1923 so this quilt is at least 90 years old. You can see there are several places where the quilt is torn or has simply worn away. When my children were small, we used this as a cover on their beds. That was a long, long time before I ever became a quilter and knew the value of this quilt. I received a couple of questions about the block used in this quilt. The block is a traditional Jacob's Ladder block, and I've drawn an outline around the block. Here is my Electric Quilt drawing to show how the blocks are arranged. There are 30 of these blocks in the drawing above. This block measures 12 inches finished. I made the half square triangles from 5 inch squares that I'd previously cut. When you make half square triangles using this method you find the finished size and add 7/8". That would be 4 7/8", but since I already had 5 inch squares I used those and trimmed a tiny bit off. There are lots of ways to make half square triangles, but I decided to use this method since I found this ruler/tool in a box in the closet. This is called the quick quarter, and comes in two lengths. I have the 8 inch. This is pretty easy. Sew on the solid lines then cut on the dashed line. The half square triangles measure 4 1/2" unfinished, and the four patches are 2 1/2" squares or they could be strip pieced. I've been working to catch up on Easy Street. I'm seeing lots of gorgeous finished quilt tops showing up while reading blogs. I really need to clean and sort through things in my sewing room, but I don't want to get all of these pieces mixed up....so I'm working to sew them together into one piece before I can walk away from this project for awhile. All of our snow has melted...our temperature reached almost 60 yesterday so today the outside Christmas lights will come down. We still have several neighbors that have their Christmas decorations out. I still have my trees up. I kind of feel that it's ok as long as there is snow on the ground so it feels like Christmas. But today it looks and feels like spring (even though I know it isn't yet) so the Christmas will get packed away and then maybe there will be time for a little sewing. Do any of you still have Christmas decorations up/out? Thanks for stopping by! Hope you are having a nice weekend. I want to show you the gifts that my friend, Roswitha from Blauraute blog sent me for Christmas all the way from Germany. 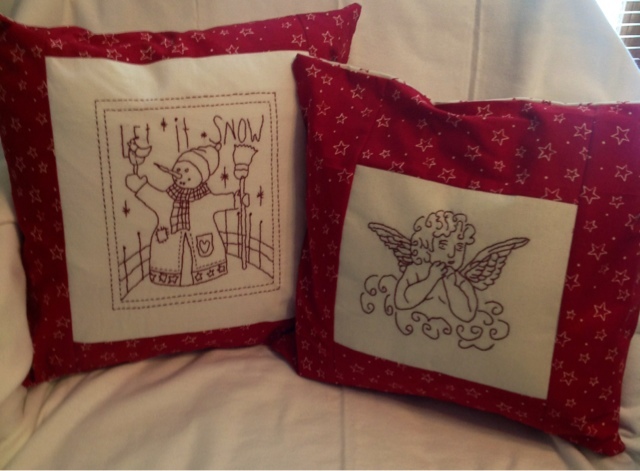 She does beautiful red work, and she knows I like angels and snowmen. 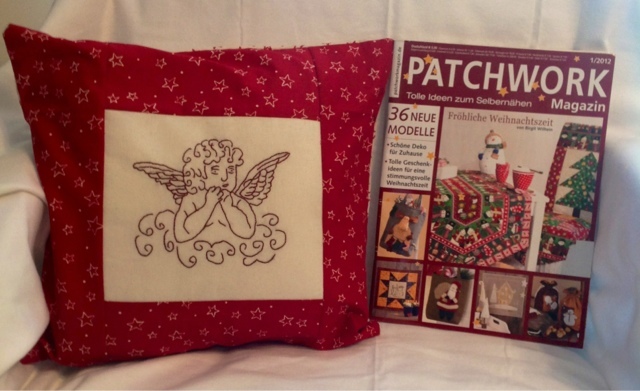 This Christmas she sent me the angel pillow and this Patchwork magazine in German. I don't speak German but I've put fabric requirements and directions into Google translator for things I'd like to make and I think that will work just fine. Here is the pillow that Roswitha sent me last Christmas. I love the snowman and she even matched the fabric. This is the gingerbread man chain that I won on her blog over a year ago. I guessed the number of spools that she had in a photo, and this is what I won. This chain hangs over our mantle at Christmas. I love these little gingerbread men. When my Grandson, Daniel, was born last March, Roswitha made this blue teddy bear chain and sent it to hang in his bedroom. I love all the little touches of crochet and ribbons on these chains. I love seeing this whenever I go to visit Daniel. Thank you again Roswitha for the beautiful and thoughtful gifts. Since it's the beginning of a new year and we've had some time to take a deep breath and relax after the hustle and bustle of Christmas, a lot of us are thinking about getting organized. As quilters, I think the first step is to not only take a look at our fabric stash but also to take stock of our UFOs. We all start the year promising ourselves that we will stay away from quilt shops and use the fabric we have stashed away at home and finish the things that we have started. So I'm starting the year with that plan in mind. I've been trying to come up with some sort of plan to try and finish up some of my projects and am still working on it. I haven't sorted through all of my UFOs yet, but I thought I would just show you a few of them. I love the color in these hexagons. I'm not sure what kind of quilt they will end up in. Maybe that's why they have been around and unfinished for so long....no plan. These are a few of the baskets from When The Cold Wind Blows by Blackbird Designs. These have been UFOs for quite awhile, too. Maybe I need to be realistic and just finish the ones that I have finished and do the ones that I have prepped and make them into a quilt that I can enjoy now. Building Houses from Scraps. I love these little houses, but they took me a long time to make. I just have a few of these. These blocks were started when I read Sonoma Rose by Jennier Chiaverini. There was a line drawing of the block in the book, so I made a few of these. Okay, I stopped after these three. This is from the book Friendship Strips and Scraps by Edyta Sitar. The top is finished and just needs quilting. I like scrappy quilts, but I think this one might be just a bit too scrappy for me and maybe that's why it isn't finished. I really love this Aunt Sarah quilt that I saw in one of the Australian magazines. I want to make it brighter than the one they show in the magazine, so I started making 3/4" hexagons that are a lot brighter than those shown in the photo. This is called The Leftover Quilt. I first saw the pattern and quilt on Ellen's blog, Little Jewel Quilts, and I rewrote the pattern to use 2 1/2" strips. I have enough blocks cut to make a larger quilt. The black and white nine patches make a great leader/ender project. I blogged about it here. This is my Phebe center. I have started the center over again. For me, this is going to be a long term project. Phebe stars. I realized that these are the wrong sized stars for the inside border with sashing so they will have to be ripped out. They will work in the outer border though. 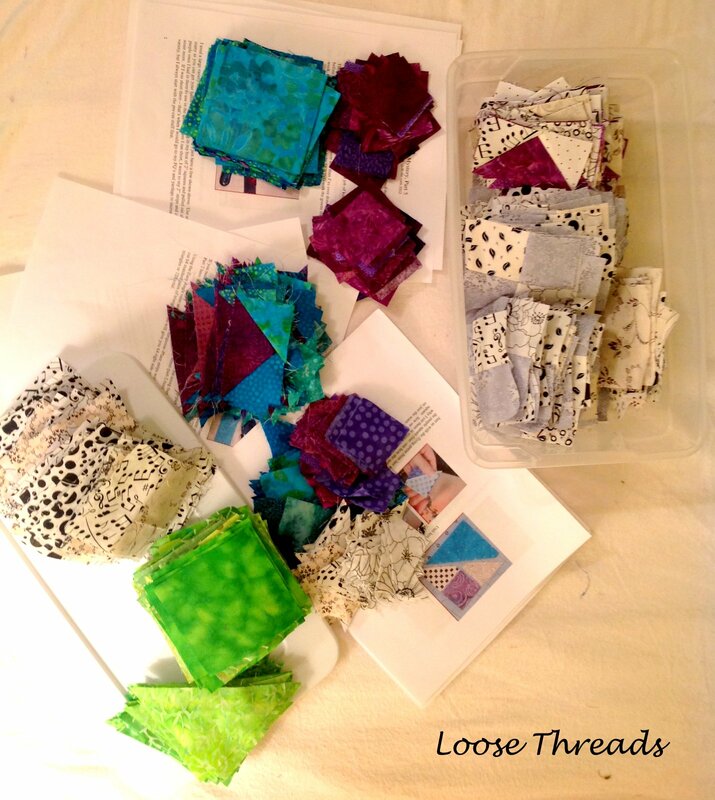 One of the experiments from my post On Point Quilt from Charm Squares found here. This quilt is one that I drew up in Electric Quilt. I made it in another colorway that you can see here. I've been working on this one off and on for awhile now. It is all quilted, and I sewed the binding on. After looking at it, I really think it needs a border. So I tore the binding off and decided I was going to add a black border on it along with batting and backing and then quilt it. It has kind of turned into a nightmare project. This little tumbler is from a kit I won from Kathie over at Inspired by Antique Quilts blog. I am hand quilting straight lines vertically on this one and have about 1/4 of it finished. Extra Christmas present blocks that I made from charm squares. You can see my post on how to make this smaller version here. My jelly roll race quilt from our Dear Jane retreat in Shipshewana last fall. My Orca Bay that still needs the plain inner border and the pieced outer border. These Bonnie Hunter mystery quilts are really neat looking once you get them all put together. I will finish the border soon, but her quilts have so many pieces that I like to at least get the blocks put together before I can walk away from it. These are just a few of my UFOs. I have more in different stages that I plan to make some decisions on...either get them out and work on them or pass them on to someone that will. Happy New Year to all of you! Just for fun, I thought I'd go back through my photos from the past year to see how many quilt related projects I'd actually finished. Here are the ones that I could find that are completely finished. This table topper and tutorial along with the Norwegian Christmas Hearts table cover in the second photo were posted on Sew We Quilt as part of a month of runners and table toppers in March. Here are a couple of heart table toppers I made. One is made using string blocks and the other is half square triangles for those that don't enjoy making string blocks. Dresden quilt as you go table topper. Trip around the world quilt for my grandson done in Funky Monkey fabrics by Moda . Two flag little quilts from the Little Quilts book along with a knit red, white and blue dishcloth for July 4th. A Christmas table topper/little quilt I made from a challenge the previous year. A lot of the fabrics were supplied to us to see what we could make. A Daffodil table topper that I machine quilted and finished this past summer. This was an old UFO: nine patch and applique' quilt. I finished the applique' border and machine quilting this summer. This is a quilt that I saw in a magazine and fell in love with. It is in an article featuring Sarah Richardson's summer house. 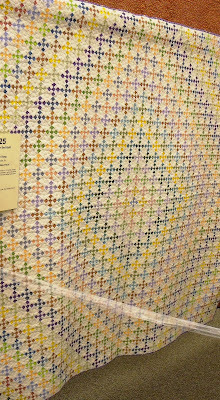 This is the quilt hanging in her guest room. I drafted the quilt in Electric Quilt, pieced the top and machine quilted it this past year. I have a tutorial that I plan to post sometime this year. The handsome guy on the quilt is my grandson, Daniel, born March 21, 2012. Here is a better look at the quilt. This is another little quilt/table topper that I gifted to a friend for her birthday this past summer. This is another Dresden Plate table topper. This one along with the tutorial was part of the Wicked Blog Hop for Halloween at Sew We Quilt. Another table topper for Halloween using an experiment I tried by sewing squares together into a rectangular shape and then sewing them back together to make an on point quilt. The post can be found here. This table runner and pillow were made as part of the Holiday Lane blog hop over at Sew We Quilt.